The second half of the 2016 season began yesterday, and it couldn’t have gotten here quickly enough, right? I’m sure you’re all excited to see how the last 73 games of the season play out for the ol’ Redlegs. –Your Cincinnati Reds, of course, were 32-57 at the break, and in last place in the National League Central division, 21.5 games out of first. The last time the Reds finished last? All the way back in 2015, when the Reds finished 36 games back. So yes, there is a distinct possibility that the Reds will finish last in back to back seasons. The franchise hasn’t achieved that particular feat since 1982/1983. Amazingly, before last year, the Reds hadn’t actually finished in last place since that 1983 season. As bad as the Reds were during the first decade of the 2000s, it’s kinda amazing that they never actually finished at the bottom of the division. –More bad news: Cincinnati’s “winning” percentage is .360 at the halfway mark. If the club were to finish the season with that percentage, it would be the second worst performance in franchise history; only the immortal 1934 Reds, who went 52-99, had a lower winning percentage (.344). The Reds are now on pace to finish the season with a record of 58-104. Only one team in Reds history has ever lost more than 100 games — the 1982 Reds, who were 61-101 just one year after posting the best record in either league. –Three years after losing 101 in 1982, the Reds won 89 games and finished in second place. I expect the current version of the Reds to accomplish similar things. –Only once before in team history have the Reds had back to back seasons with a winning percentage below .400. From 1930 to 1934, the Reds had five consecutive seasons below .400. –The bullpen leads the majors in a number of categories, including innings pitched (325) and home runs allowed (66). Cincinnati relievers have also surrendered 18 homers to the first hitter they faced. –The pitching staff as a whole has given up 154 homers, which leads the league by a wide margin. If they keep up the pace, they’ll shatter the major league record for HR allowed (241). –Okay, enough about the historic futility of the 2016 Reds. Let’s shift gears. Adam Duvall made his first All-Star Game this year, in his first season as a full-time starter in the big leagues. Jay Bruce joined him in San Diego for the All-Star festivities. It’s Bruce’s ninth big league season, and third All-Star appearance. Yet, Duvall is just 17 months younger than Bruce. 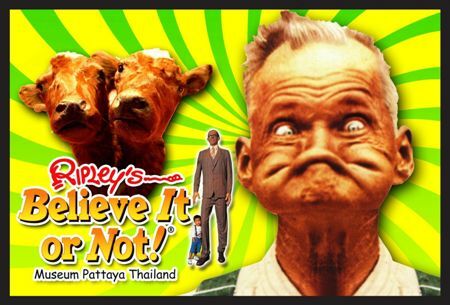 Believe it…or not! –Duvall has obviously been the biggest surprise of the season, hitting .249/.288/.551 with 23 home runs and 61 RBI. Only three other Reds have been above-average contributors with the bat. You know about Bruce: .267/.315/.538. And Zack Cozart has been fantastic this season, as far as I’m concerned: .267/.316/.482, 14 home runs, and an incredible glove. As I’ve noted before, I was really afraid that Cozart’s defensive prowess would take the biggest hit from that horrific injury he suffered last year. He hasn’t skipped a beat. Cozart is one of the more underappreciated Reds of recent years, in my opinion. –The other above-average offensive contributor this year, of course, is Joseph Daniel Votto. Here are some figures that will be surprising to most people: Votto leads the Reds in both wRC+ (120) and wOBA (.357). By the advanced measures, he has been the most productive hitter on the team through the middle of July. Even typing those words surprises me, because of how awful Votto was early in the season. Honestly, I didn’t think we’d ever see Votto struggle like that (and I hope we don’t ever see it again). I wish I could explain why Votto hit just .207/.330/.367 over his first 50 games of the season. I have some theories, but no firm conclusions. Since game 51, however, Votto has hit .312/.456/.552. That’s more like it. I see no reason to expect Votto to be anything other than his usual productive self for the rest of the season. –Amazingly, despite the horrific first couple of months, Votto has the highest OPS in all of baseball since last year’s All-Star break. –You already know what I think about Billy Hamilton. I won’t say any more than that, except to say that I remain optimistic. 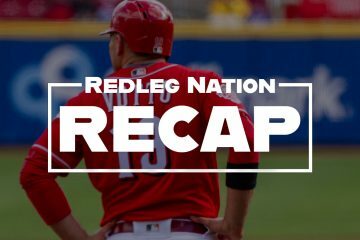 –Here’s why I’m optimistic that the Reds will improve over the remainder of the season, and why I think they might even avoid losing 100 games: the pitching has to be better. In the rotation, a total of 24 starts were given to Alfredo Simon, Jon Moscot, Tim Adleman, Daniel Wright, and Tim Melville. None of those pitchers (fingers crossed) are likely to start a game the rest of the way, barring injury. And Homer Bailey should return at some point, as well. The Reds should be able to put together a rotation of legitimate major league pitchers in the second half, which is something they couldn’t do earlier this year. The bullpen is going to be markedly better, too (and we’re already seeing signs of that). Raisel Iglesias (who I continue to hope will be a starter in years to come) and Michael Lorenzen are miles ahead of the likes of Caleb Cotham and JC Ramirez and Keyvius Sampson and AJ Morris and Drew Hayes and Steve Delabar and Dayan Diaz and Layne Somsen and JJ Hoover. * Tony Cingrani has settled nicely into a relief role, as well. *That is the list of Reds relievers who have an ERA of 6.30 or higher in 2016. There is reason for optimism with this pitching staff in the immediate future. Things can’t get any worse, right? –Biggest surprise of the first half might be Tucker Barnhart and his .333 on-base percentage in Devin Mesoraco’s absence. Combine that with his good defense, and you have a nice little backstop. I bet Barnhart will play in the big leagues until he’s 39 as a backup catcher. 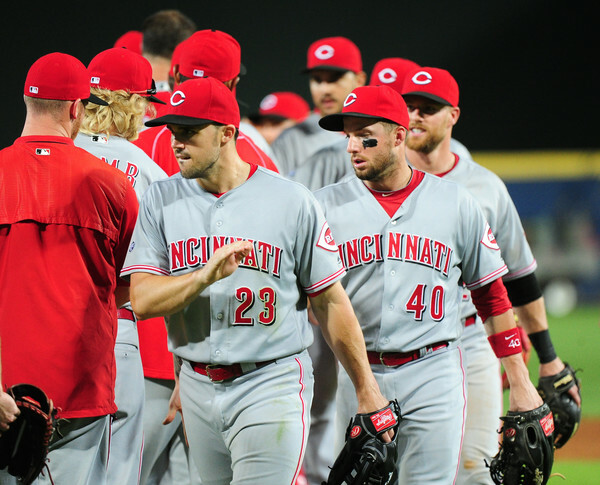 –The Reds only have to go 31-42, a .424 winning percentage, to avoid losing 100 games. That seems achievable. –I hope Jose Peraza gets to play more in the second half. Not much more I can say. Brandon Phillips is a Reds legend, but we always knew we’d have to move on some day. If we’re going to learn anything about Peraza’s ability to handle second base, this is the year to find out. 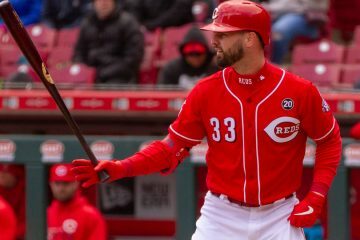 –Peraza, Eugenio Suarez, Hamilton: three guys who have a chance of being real contributors on the next good Reds team, and they’re all 25 or younger. Throw in 22-year-old Jesse Winker, since he is likely to finish the season with the Reds. Reed, Stephenson, Finnegan, Iglesias, Lorenzen, Amir Garrett, DeSclafani, John Lamb, Dan Straily, Tony Cingrani: all age 27 or younger, all with some degree of talent, and all with a chance of being on the next good Reds team. Those are 14 good reasons to watch the Reds the rest of the way. Those names are a big part of the future of this franchise. Throw in Votto, Bailey, Duvall, Cozart, and Bruce (at least until one or more of those guys are traded), and I think there are plenty of compelling storylines to keep us entertained, even if the wins are few and far between. I know I’ll be watching. I can’t help myself. Aaah, Lipscomb. That’s in Nash-Vegas, right? Aaah, that makes sense. One of our long-time readers! I expect to see Melville & Adleman in future “obscure Red of the Day” segments. Awe yes, holy bruce berenyi batman. Maybe the metric stats were bad, but Adleman at least seemed like a decent pitcher from the eye test and basic stats like ERA. Isn’t he currently on a rehab? Probably good arm for starting AAA depth or possibly reliever? It does appear Adleman is pitching for AAA tonight, I assume it is rehab. Our pitching is talented and deep.Once they get more experience they become better because most all of them have swing and miss stuff.I want to see more and more of our position players that maybe part of our future and for the life I can’t understand why that isn’t happening. If the Reds 2nd half does get any worse, I’ll actually welcome Preseason Football. I’m hoping for three things: Peraza gets more PT. Pending trades and watching our starting staff continue to evolve.